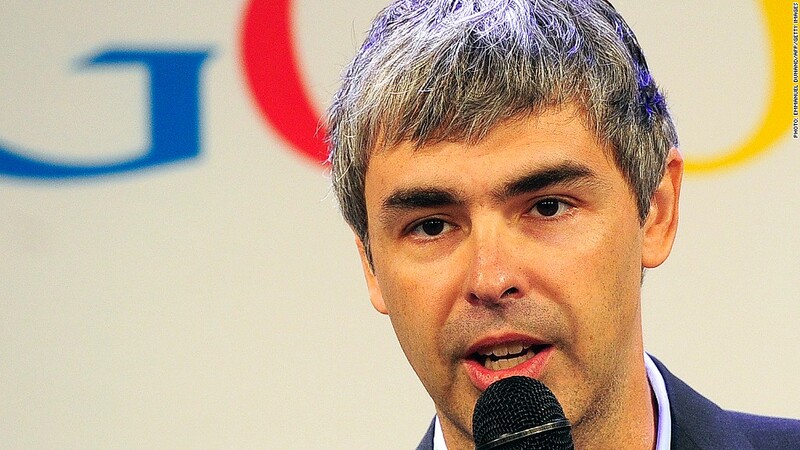 Google CEO Larry Page said this will be his last earnings call. Google's shares soared to new heights on Friday after the company reported sales and profits that easily beat Wall Street expectations. The stock jumped 12% in early trading and topped $1,000 a share -- well above the stock's all-time high of $928 set in July. All-around strength in Google's core search business drove the positive third-quarter results. Sales from both Google-owned sites and its network of partner sites both jumped by almost a quarter over the year. Search makes up 92% of Google's business. Overall, Google's (GOOG) sales jumped to $14.9 billion last quarter, a 12% gain over last year. The company earned $10.74 per share. Both figures beat estimates from analysts polled by Thomson Reuters. That broad strength in search overshadowed Google's double-edged mobile problem -- mobile advertising and the Motorola business -- which continue to plague the company. The main issue: Mobile Internet usage continues to grow, but advertisers won't pay as much for mobile ads as they do for desktop ones. So even as the number of ads clicked on Google properties increases, the company is commanding less money on average for each of those clicks. The third quarter proved to be more of the same. The number of paid clicks rose 26% over last year, but the average amount paid per click fell by 8% -- the eighth consecutive quarter in which Google's cost per click declined. Google has been working to fine-tune what it calls "enhanced campaigns," which help marketers more easily run targeted ads on both desktop and mobile. Earlier this year, Google said it had overwhelmed users with too many mobile ads and scaled back. Meanwhile, the Motorola business shows no signs of turnaround. The Motorola mobile business lost $248 million in the quarter. In the past, Google has warned that it expects Motorola's financials to be volatile for "quite awhile." On a post-earnings conference call with analysts and members of the press, Google CEO Larry Page expanded on the "proliferation of screens" in our everyday lives -- and the effect that has had on Google's approach. One stunning stat: Nearly 40% of YouTube's traffic now comes up mobile, up from a paltry 6% in 2011. Page reiterated that he wants Google to continue to spend heavily on research and development -- a point of contention with some company-watchers. Page also revealed that he won't participate in all earnings calls going forward, in an effort to "prioritize" his time. It's possible that the calls are also a physical strain for Page, who revealed in May that he suffers from vocal cord paralysis. On Tuesday, Google rival Yahoo (YHOO) reported results that were weaker than the prior year, but still in line with analysts' estimates.